SAMI has established itself firmly as the market-leading title for news and product showcasing throughout the hobby, as well as the first choice for active modellers. Focussed entirely on kits and modelling, SAMI covers a wide range of subjects, genres and scales, presenting material intelligently and sympathetically, and always aimed at engaging the reader at every level. SAMI takes a monthly look at news of future releases, in box previews of new arrivals and test shots, kit reviews built up by a team of expert enthusiasts and full build features covering all aspects of modelling, including brand new up to the minute releases and our Classic Plastic section, dealing with the many thousands of kits in circulation that date back over fifty years and more. Contributions are drawn from all skill levels and styles, allowing the magazine depth and diversity, and our aim is to assist the reader to realise their own skills and abilities. With more than enough titles offering an elitist and exclusive approach to the hobby, our message is not ‘look at what we can do’, but rather ‘look at what you can do,’ and modellers everywhere have recognised that SAMI is written not only by modellers, but for people who build models, as well as those who collect them, or just like to look at those built by someone else. 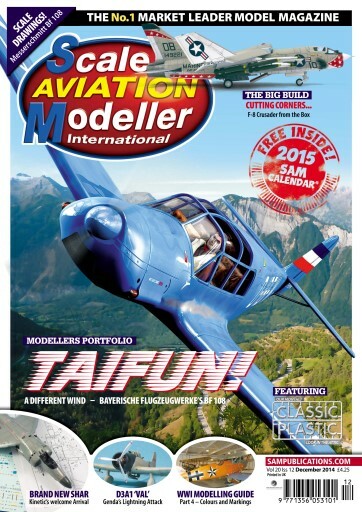 You'll receive 12 issues during a 1 year Scale Aviation Modeller Internat magazine subscription. You'll receive 12 issues during a 1 year Scale Aviation Modeller Internat magazine print subscription.